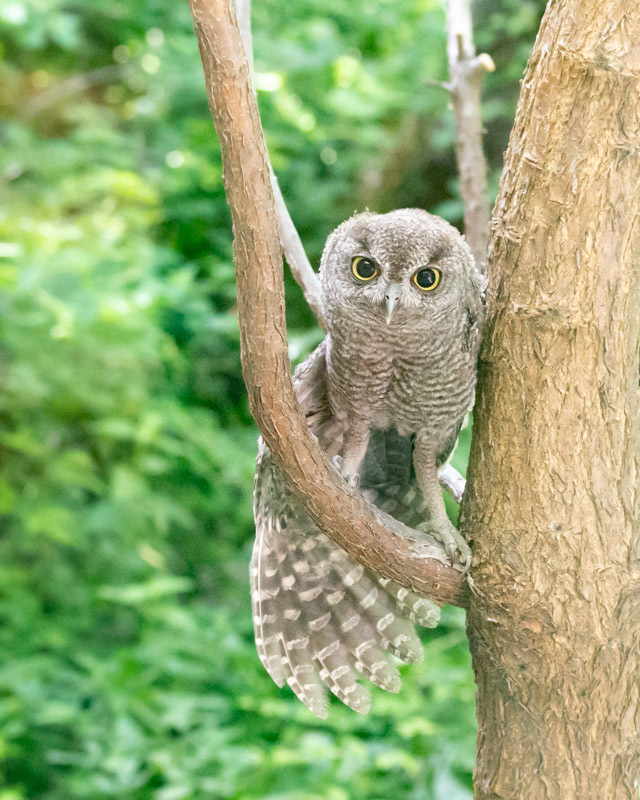 Western Screech Owls are common residents in the Foothills and range throughout the Western United States. 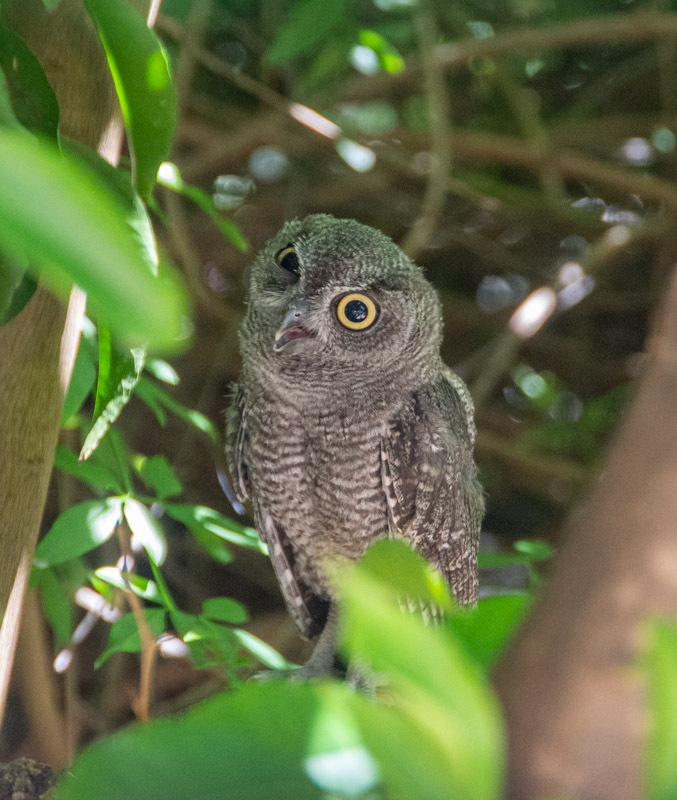 I had a family nesting in my back yard but once the young hatched and fledged, they have moved on to parts unknown to raise their young. 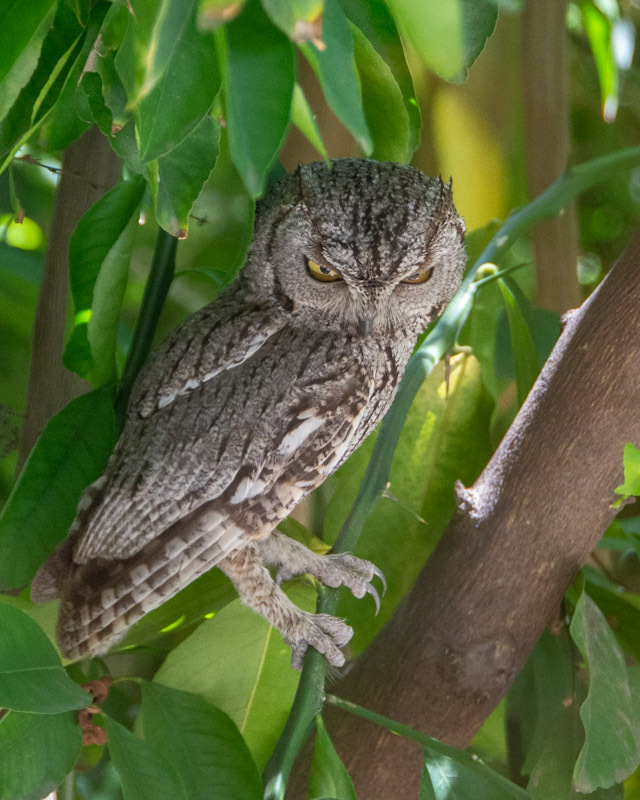 My “empty nest syndrome” has been relieved upon learning of another Western Screech Owl family living nearby in northwest Tucson. 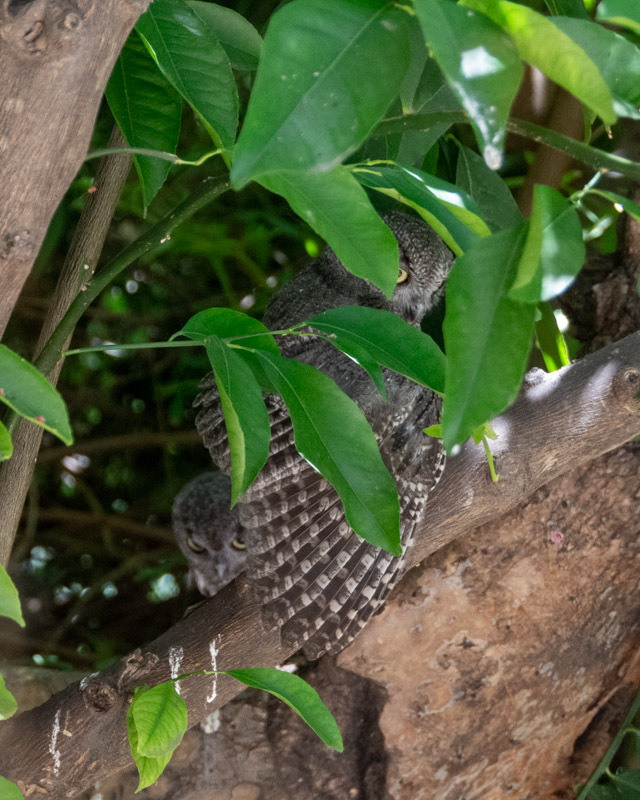 I’ve been watching this group as they rest during the day under the shady canopy of a citrus tree. 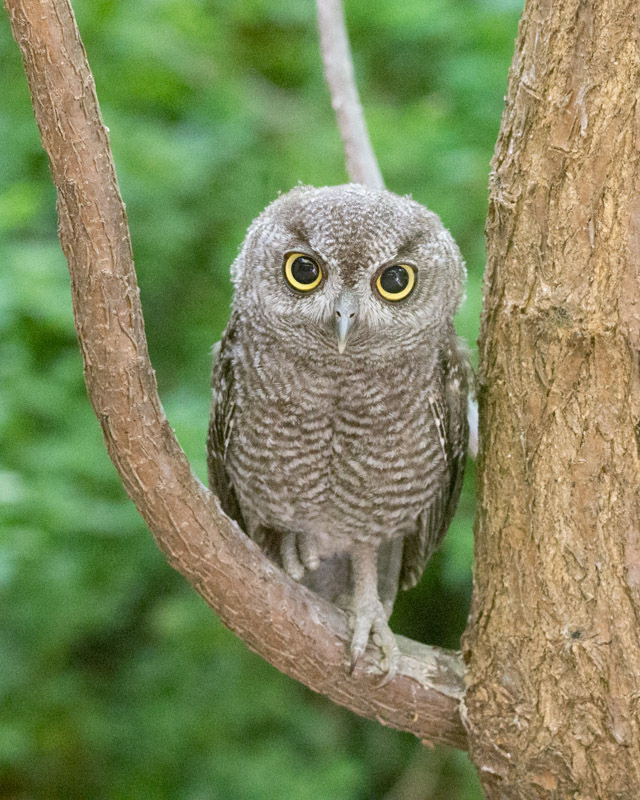 Below are some photos of the young owlets and their parents. These photos are taken through a dusty window and facing the sun, so lighting and focus are some issues I had to overcome. 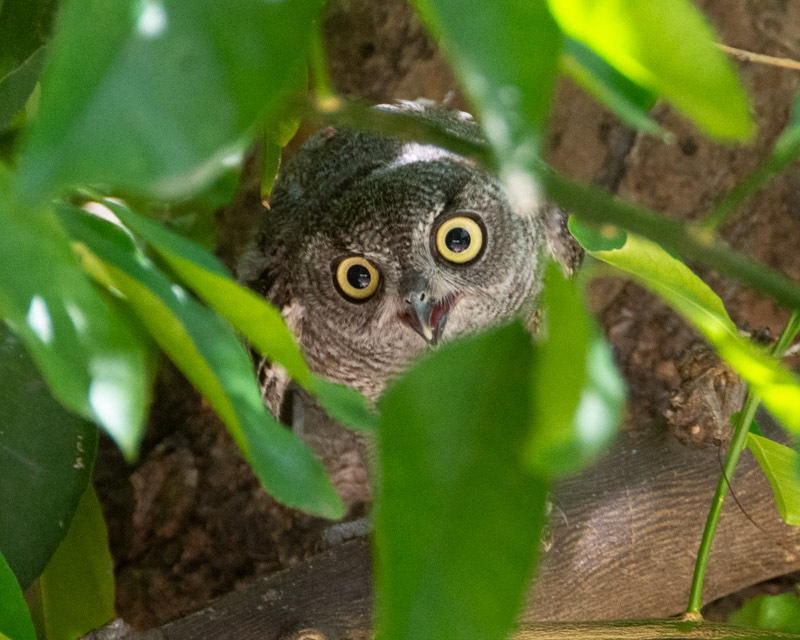 I don’t believe the owl(s) can see anything through the window. They likely are looking at their own reflections in the ‘mirror’ed glass. You can see the irregular reflection of light in their eyes. Those eyes are just too cute. Their faces are so inquisitive as they study the world around them. One parent is usually close by. 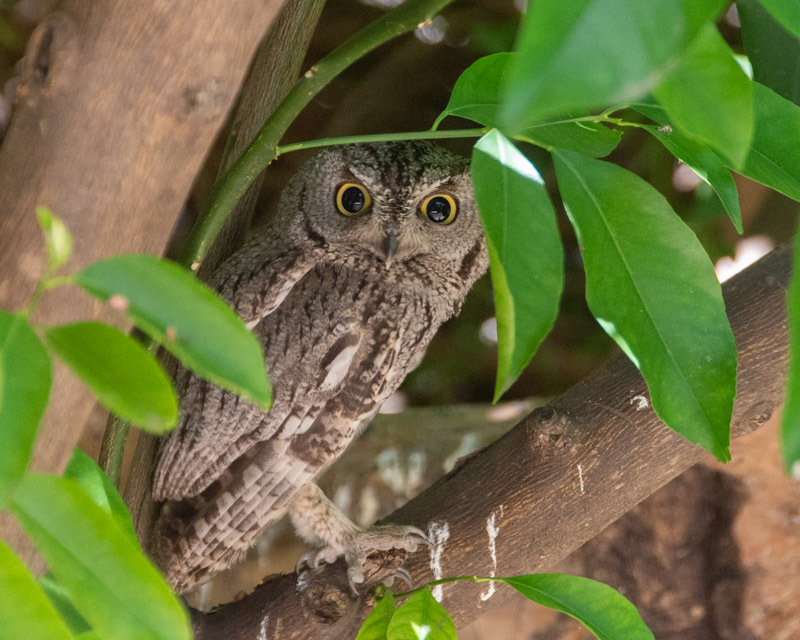 The thick leaves often keep the birds hidden or make any clear photos of the entire bird nearly impossible. 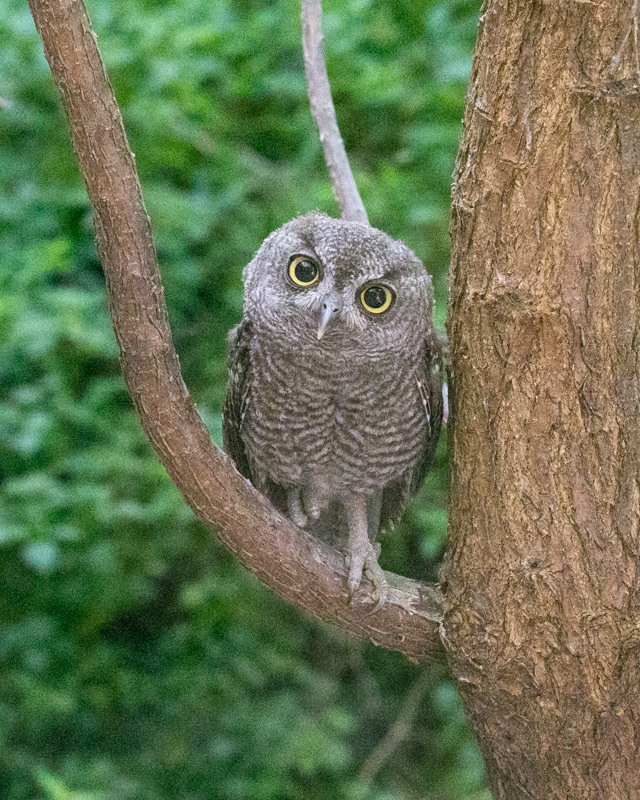 You can see the difference in the feathering of this adult compared to the featuring of the young owlets. Peek-a-boo. 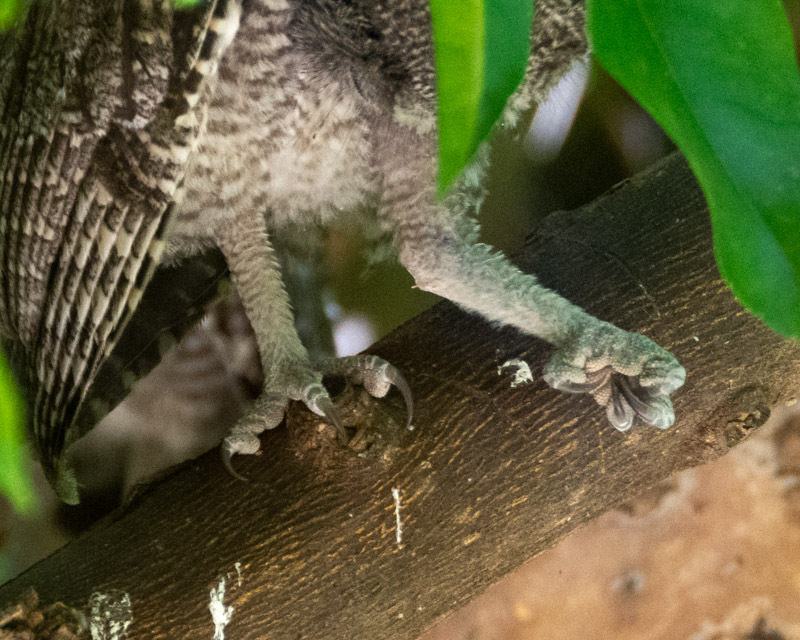 During this wing stretch, the owl is looking towards me hidden by a leaf while a sibling peaks out from behind the wing while on another branch. 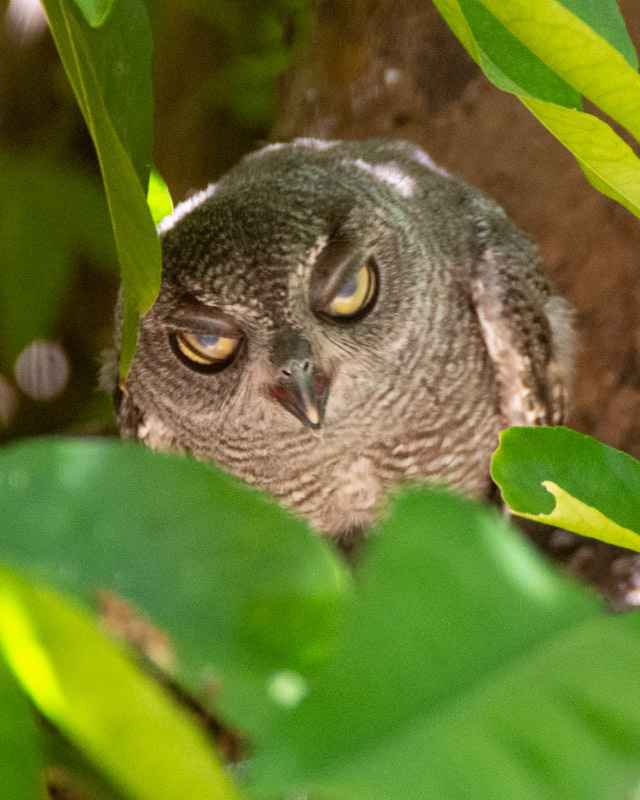 We humans can read a lot into this expression, but who knows what, if anything, the owl was thinking. 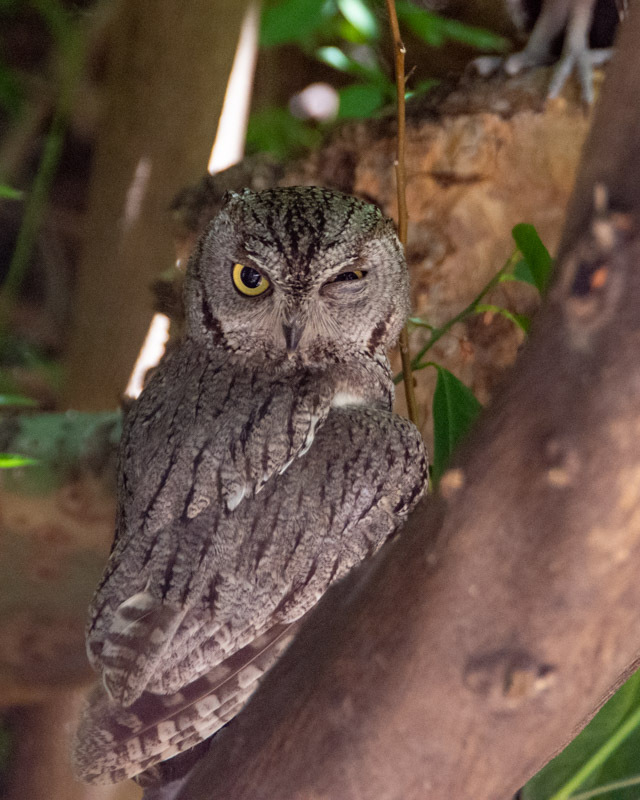 Similarly, who knows what this bird was thinking, but it doesn’t matter. It still wins awards for cuteness. Then again, with its nictitating membranes, the bird can imitate a zombie. The cuteness disappears. 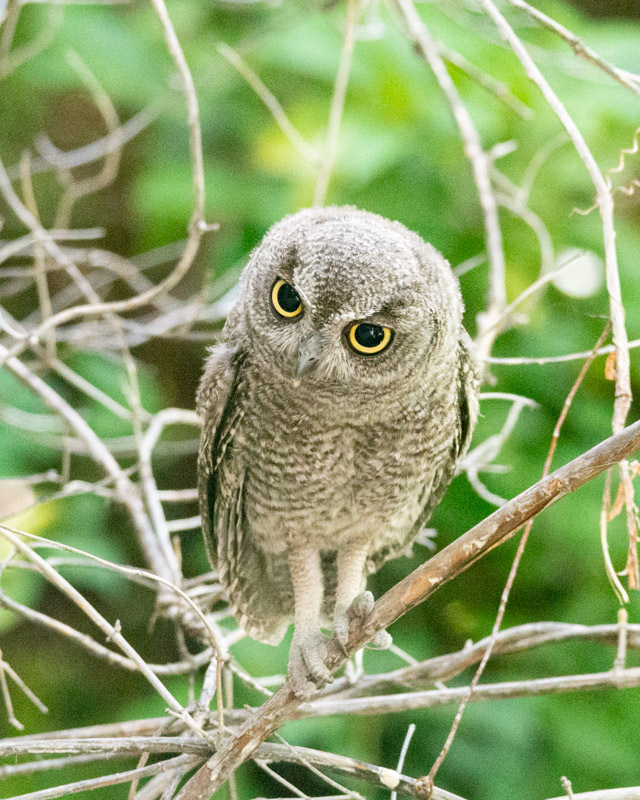 And although these owlets are young, they still have the hunting and killing tools they need to succeed as adults in their world. One last look at what I believe is the male parent. Often we only see one adult with the young birds. One time, a second adult flew in- the bird below. I assume it was the male but cannot be certain.